EOC is committed to making sure that employment decisions are based on skill and ability, and that qualified applicants and employees have equal opportunities for recruitment, selection, and advancement at Carolina. Download a brief summary of EOC equitable employment opportunity services. Diversity brings great value to our students, employees, and the people of North Carolina. Every year, EOC builds a plan that shows the composition of Carolina’s workforce and that establishes the path the institution will follow to help meet the University’s commitment to an inclusive, welcoming, and diverse work environment. Access a copy of the current state and federal plans. The University is required to collect employee disability, ethnicity/race, gender, and veteran status information to comply with state and federal laws, executive orders, and regulations. These forms are used to collect this information. The three forms below should be included in the new hire package that is sent by the hiring department or HR representative to all new hires. When the completed forms are returned to the HR representative, the forms should be sent to EOC to be entered into ConnectCarolina. 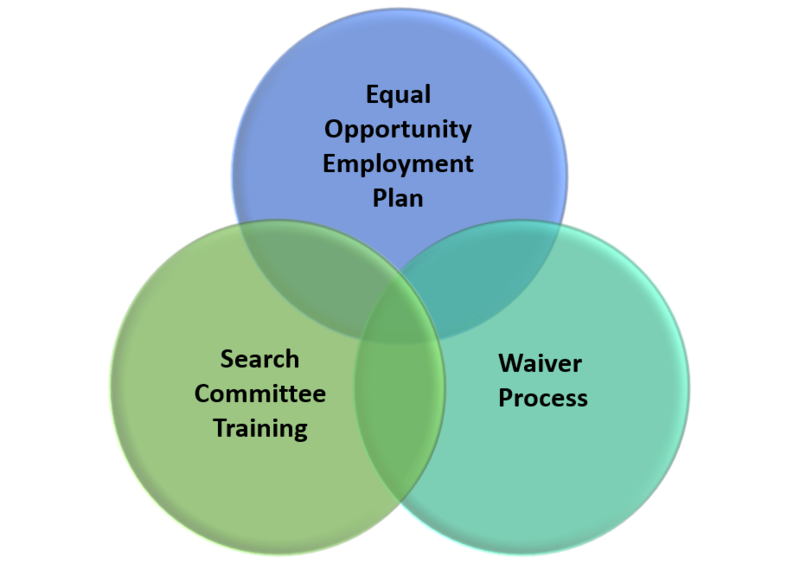 EOC oversees waivers in the employee recruitment process for all positions at the University regardless of the classification to ensure fair and equitable recruitment efforts. Waivers are an exception to the normal, open recruitment process. If you are seeking a waiver, contact Rudy Jones, associate director, EOC to request a “Waiver of Recruitment Action.” EOC staff can help you through the process, determine the appropriate waiver type, and review the waiver application to ensure that the reasons for pursuing the waiver (i.e., the employee has unique qualifications) are valid. Office responsibilities for overseeing fair and equitable employee recruitment have recently changed and are detailed below. Contact the below offices for questions about starting and completing the recruitment process. To register for a training, you must create an account online through the North Carolina Learning Center. Learn how to create an account through this online portal. Download a short summary of EOC equitable employment opportunity services.